When you create a virtual machine (VM) in the Azure portal, a public IP resource for the virtual machine is automatically created. You use this IP address to remotely access the VM. Although the portal does not create a fully qualified domain name, or FQDN, you can add one once the VM is created. This article demonstrates the steps to create a DNS name or FQDN. Select your VM in the portal. Under DNS name, click Configure. Enter the desired DNS name and then select Save. To return to the VM overview blade, close the Public IP address blade. Verify that the DNS name is now shown. 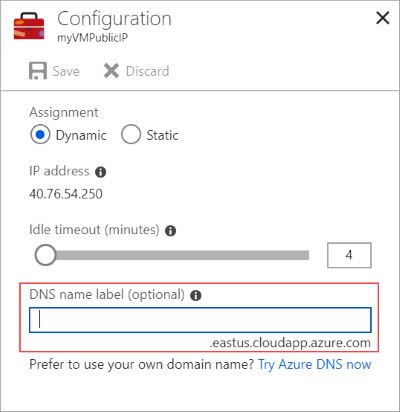 You can now connect remotely to the VM using this DNS name such as with ssh azureuser@mydns.westus.cloudapp.azure.com. Now that your VM has a public IP and DNS name, you can deploy common application frameworks or services such as nginx, MongoDB, Docker, etc. You can also read more about using Resource Manager for tips on building your Azure deployments.